Battlestar Galactica is a 2004+ military sci-fi TV series. It is a reinvention of a 1978 TV series. Nevertheless it’s one of those major, much better TV series of the 2000s with much more complex plots, grittier settings, heavier themes, etc. than in previous decades. The core plot of the series is the flight of the last survivors of humanity after the cataclysmic attack by the alien Cylons. The titular Battlestar Galactica is the last capital ship left for the ragged human refugees. Our BSG2004 profiles are short notes for people who watched the series. As such they have S P O I L E R S and are primarily about DC Heroes RPG capsule stats. Known Relatives: Zak (brother, deceased), Father (Admiral Adama), Duella (wife, deceased), Mother (deceased). Group Affiliation: Crew of Battlestar Galactica / Colonial Fleet. Base Of Operations: Battlestar Galactica, later Battlestar Pegasus. Height: 5’9” Weight: 175 lbs. Lee is a Colonial fleet officer of vast experience both pre and post apocalypse. He is a leader of men and leads by example. He was promoted to fleet rank, Commander of the Pegasus and later left the military and went into politics. When Admiral Adama and President Roslyn left the fleet, he stepped in and filled his father’s colossal shoes. Instead of being an admiral he became President. Lee is an excellent Viper pilot and solid combatant with both pistols and unarmed. Lee ’Apollo’ Adama is one of two sons of the legendary Cmdr. Adama. He and Zak’s girlfriend Kara “Starbuck” Thrace were older than Zak and certified combat pilots when Zak came to his final exams. Zak was killed in a crash. Kara, Cmdr Adama, and Apollo all blamed themselves. The relationship between the three cooled from a close family to a cool angst and distrust over the next several years. Apollo was in the area of Galactica in the time of its decommissioning. During the Apocalypse he was with the (soon to be appointed) President. He sided with her in the battle of wills against his father and the military. During the next several months of battles and hard choices he made peace with both Starbuck and his father. He became CAG for the Galactica although his support for the president and the civilian government still caused some friction. Cmdr (William) Adama felt that being a together as human beings in these end times was the most important thing. Kara and Apollo silently assented. When the Pegasus arrived and rejoined the fleet William Adama needed those he could trust and military leaders to fill the void of the murders in the Pegasus command. When William Adama was promoted to Admiral, he promoted Apollo to Commander after a bloody battle. Apollo took on a great many jobs after the destruction of the Pegasus and his leaving the military. He was a defense attorney and pubic speaker. Eventually he became president when there was no one else who could do the near impossible job. When Mighty Admiral Adama finally cracked under the strain Apollo was there to take the load. When in the final days of the fleets journey and authority and government he broke down he proved an inspiration to the entire remaining human race. Commander Lee Adama looks like a recruiting poster for the Colonial Military services. He is strong featured man with rolling muscles and masculine good looking features. In a business suit he looks like a soldier. Apollo would look like a solder in a tutu and flippers. Apollo starts out the kind of man who would be a good guy in a black and white world. In the harshly ambiguous would he lives in he is often divided in loyalties between the various ’right‘ things to do. As time goes by he evolves quite a bit and grows very much in his father’s mold. He becomes comfortable with the preposterousness of his life. Tragedy and miracle are just par for the course and things he takes in stride. 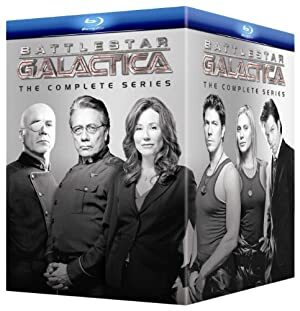 Battlestar Galactica is a self contained story and the characters should only be used together. It could be interesting to have a guns-and-planes character visit the Galactica Universe. Alternately you could have the Galactica arrive at Earth with the Cylons in pursuit, bringing their war to the DCU’s doorstep. Or worse, maybe the Cylons have arrived ahead of the Galactica and begun infiltrating Earth’s population. The robotic Manhunters were revealed as having done something similar in the Millennium mini-series. Or a world we could call DCU-G (Read Admiral Adama for the background). 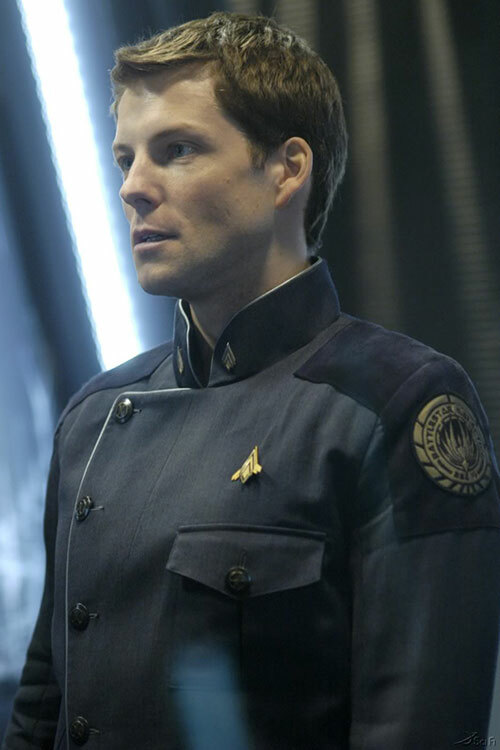 Lee Adama commands the farthest out station, Picon, in the solar system his shatter people live in. He is the front line defense against the Cylon centurions in his system. Lee has a strong love/hate relationship with his father and does not get along well with Colonel Tigh. The three all know that humanity’s survival may rest on their ability to get along amidst personal problems. When the characters arrive at Picon to investigate the Cylon infiltrators he will be reluctant to trust them. There will be dozens of minor intrigues going on on Picon station. Likely a Cylon base ship will attack while the players are there investigating. Iron Nerves, Local hero (Military), Rank (Former Captain, Colonial Fleet ; former President of the Colonial Fleet). Admiral Adama (High), President Laura Roslin (High), Lt. Starbuck (Low). Authority Figure, SIA toward Starbuck. Apollo also owns a special Viper (a Viper mark VII, rather than the standard Galactica mark II) that was a much later build. Until the arrival of the Pegasus, it was one of the few that survived the Apocalypse. Speed, communications and weapons maybe one AP higher than normal, though some advanced features were likely downgraded to avoid the Cylon Virus. Helper(s): http://scifi.com/battlestar/characters , Roy Cowan, Nick Yankovec, Andrew Lee, Frank Murdock. Source of Character: Battlestar Galactica 2003/2004.